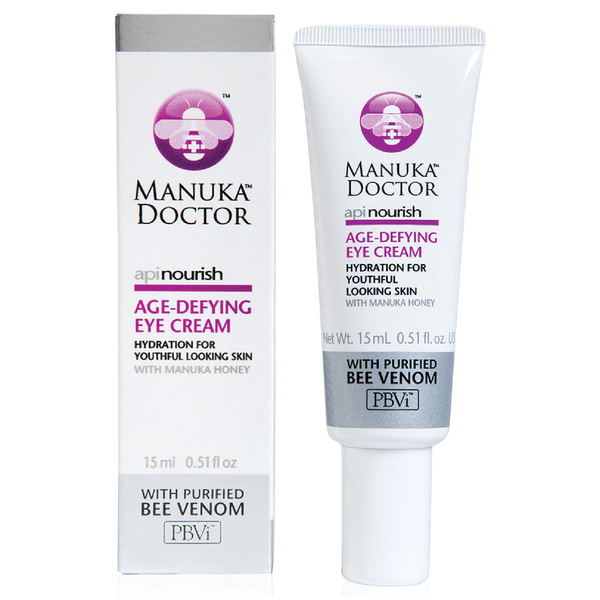 Target dark under-eye circles and minimise wrinkles with the ApiNourish Age-Defying Eye Cream from Manuka Doctor, an anti-ageing formula that helps to smooth and revitalise tired skin around the eyes. Infused with Purified Bee Venom™ and manuka honey, the hydrating treatment boosts collagen and naturally stimulates elastin reproduction to plump skin and refine the appearance of fine lines and crow's feet. Skin-tautening tannins from oak, extracts of botanical Silicon and an advanced Octapeptide are each clinically proven to help reduce the depth of wrinkles, working to smooth and tone their appearance for a more youthful looking eye area. Alpha Glucosyl Hesperidin is a flavonoid found in citrus fruits, which encourages the surface circulation of skin to improve dark circles and lift dull complexions. Complete with the moisture-boosting properties of Hexapeptide and Vitamin E, the eye cream is an innovative must-have product to restore and renew, leaving you looking more youthful and awake. Aqua (Water), Mel (Honey), Polyacrylamide, Cyclopentasiloxane, Caprylic/capric Triglyceride, Oryza Sativa (Rice) Germ Oil, Ammonium Acryloyldimethyltaurate/VP Copolymer, Phenoxyethanol, C13-14 Isoparaffin, Butylene Glycol,Shea Butter Oleyl Esters, Laureth-7, Tocopheryl Acetate, Stearoxy Dimethicone, Glycerin, Disodium EDTA, Ethylhexylglycerin, Glucosyl Hesperidin, Triethanolamine, Dimethicone, Panicum Miliaceum (Millet) Seed Extract, Caprylyl Glycol, Opuntia Ficus-indica Stem Extract, 1,2-hexanediol, Bee Venom, Tannic Acid, Potassium Sorbate, Acetyl Hexapeptide-37, Acetyl Octapeptide-3.